How do I create an account-level Rubric? In Account Navigation, click the Rubrics link. Edit the rubric title by typing in the title field. Click the Pencil icon next to the Criterion name to edit the Criterion description. Click the View Longer Description link to edit the criterion's longer description. A popup window will appear in your browser where you can edit the longer description. To add a rubric rating, mouse over a cell wall and click on the double-ended arrow  to split a single cell into two. Split cells on the row as often as necessary to created the desired number of ratings. Hover over the rubric rating you wish to edit. 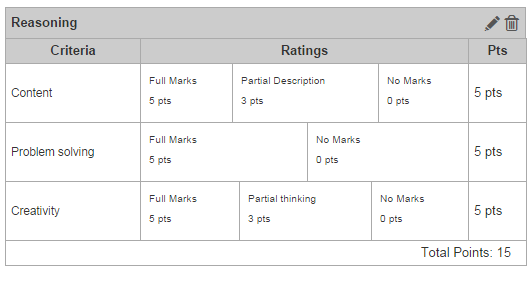 Click the Pencil icon  to edit the rubric rating. If you split a rubric cell, you can delete the split and combine the cell back to its original state. Click the X icon  to delete the rubric rating. Edit the point value of an entire criterion by typing in the points field . Click the Delete icon  to delete the criterion. Click the Add Criterion link to add a new criterion to the rubric. Click the Find Outcome Criterion link to align course or account level outcomes with the rubric. Click the Create Rubric button.